Inevitably when a film comes out that is presented ‘found footage' style there is chorus of critics claiming the format is overdone and dull. Ideally, found footage strips away the artifice of cinema (or at least it gives the illusion of stripping it away.) When done right it can lend everything an air of verisimilitude. It's used to a chilling effect in the dream messages of Prince of Darkness (1987). The Blair Witch Project (1999) still divides a lot of opinions, but it’s easy to forget that many people thought it was real when it first hit theaters. At the same time, that sense of realness is a double edged sword, by removing certain conceits of traditional narrative it is forced to employ it's own. Often characters have to be very unobservant, and hell bent on filming no matter how much danger they are in, Paranormal Activity 4 (2012) is perhaps the most recent film to succumb to this problem. 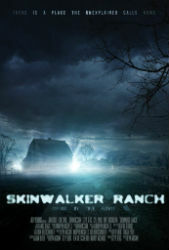 Skinwalker Ranch embodies both the strengths and weaknesses of the found footage horror film. The film opens on a young boy celebrating his birthday with his father (Jon Gries). The boy vanishes in a brilliant light. The father is put through the wringer legally, which attracts the attention of a paranormal investigation team. With the father’s permission, they set up cameras all over the ranch. The team views floating lights, loud noises, and strange footprints. Things escalate quickly, as whatever mysterious force that lurks around Skinwalker Ranch definitely means harm to everyone. Skinwalker Ranch opens with the well-staged and unsettling disappearance of a child but soon looses steam when it employs a pretty bog standard found footage element, the paranormal investigation team. There are some steps taken to set up basic character conflicts, but most of these are barely touched upon by the end of the film. With the preliminaries out of the way, the movie gets down to the scares and here it works very well. The threat doesn’t mount up so much as it comes barreling at the characters almost immediately. The nature of the threat is kept vague, and the imagery of ghostly lights, alien shapes and what amount to monster wolves keep things engaging. The quick pace and short running time work in its favor as well, there's very little time to consider the threadbare plot. With so much obvious danger present, why would anyone remain there? Only the ranch owner really has anything invested in staying, everyone else just seems reckless. It gets to the point where they are chasing giant wolves down into caves in the middle of the night and no one stops to question what the hell they are doing. Visually everything looks a little too well composed and lit to be convincing (Just to nitpick a little: There is a sequence that is supposedly shot on 8mm film from a 1970's hand held camera, but it’s in widescreen?). Most of the effects work is very good, except for dropping the ball during a key point of the climax. The strange silent coda to everything almost makes up for it. Don’t go into Skinwalker Ranch expecting any answers to what’s presented, it’s merely a 70 minute vehicle for scares and in that respect it works admirably if not necessarily intelligently.